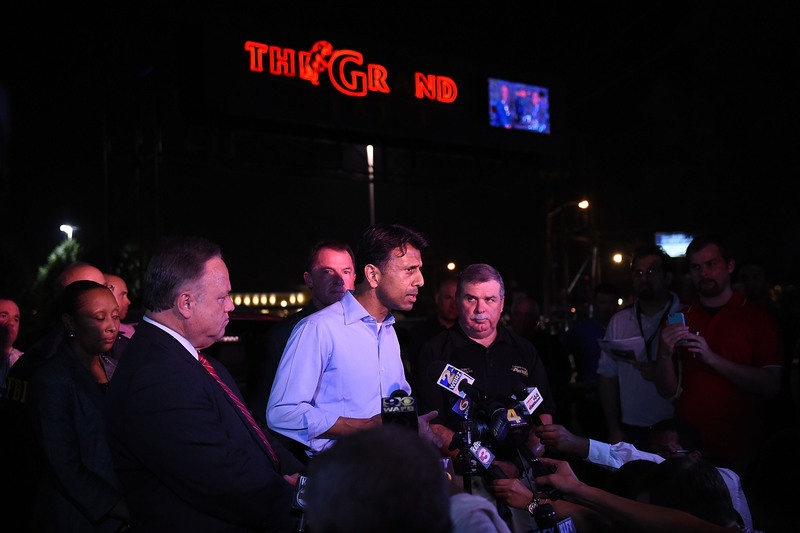 Throughout Thursday night, officials continued to provide updates to the Louisiana theater shooting that left at least three people dead, including the gunman who, according to authorities, turned the gun on himself. Police first responded to calls at around 7:30 p.m. to a Trainwreck showing at Grand 16 Theatre in Lafayette, the city's police department said via Twitter. There appears to have only been one shooter, authorities said. During a press conference Thursday evening, Police Chief Jim Craft said there were nine people with a range of non-life threatening and critical injuries. He also said three people died, including the shooter from a self-inflicting gunshot. Officials said the gunman was a 58-year-old white male who was a theater patron but declined to disclose his identity due to the ongoing investigation. The suspected gunman has a criminal history, though it was from many years earlier, according to Craft. Investigators are currently looking at various factors such as where he lived, people who he was associated with, and what websites he was on. They declined to disclose the shooter's weapon though they said it was a handgun. As governor, as a father and as a husband, whenever we hear about these senseless acts of violence, it makes us both furious and sad at the same time. ... This is an awful night for Lafayette. This is an awful night for Louisiana. This is an awful night for America. There were around 100 people inside the crowded theater when the shooting took place, and officials said they had already begun questioning witnesses. Streets in the surrounding area have been closed. Comedienne and actress Amy Schumer, who stars in the film that was playing at the time, took to Twitter to express her condolences. She tweeted, "My heart is broken and all my thoughts and prayers are with everyone in Louisiana."